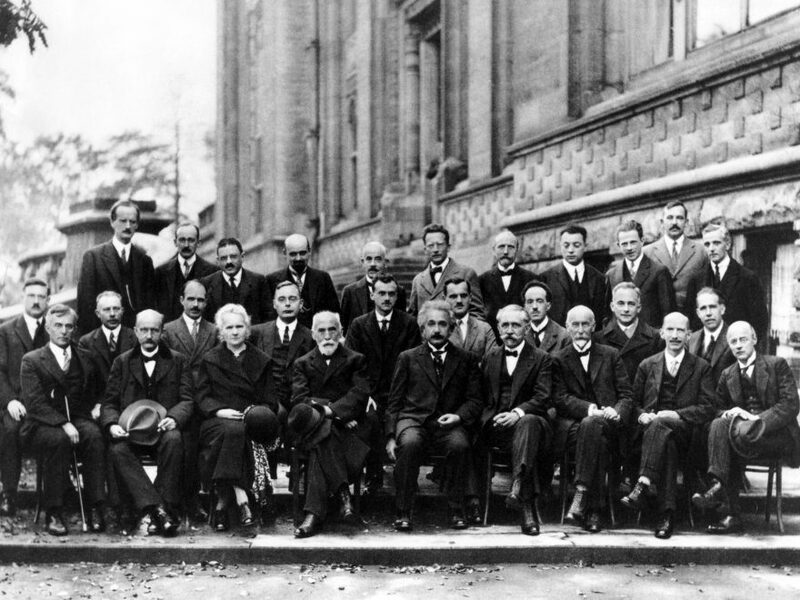 Despite efforts to increase women’s and minority’s participation in physics, physics is still overwhelmingly white and male. For example, only about 10% of physics bachelor’s degrees awarded to US citizens or permanent residents who identified as black, Hispanic, or Native American and only 20% were awarded to women. At the graduate and faculty levels, the numbers aren’t much better. As the current pool of graduate students will go on to become tomorrow’s professors and scientists, they will directly shape the future of the discipline and who is viewed as a physicist. As graduate school often acts as the gatekeeper to becoming a professional scientist, understanding how graduate school admission practices may promote or hinder diverse students from pursuing graduate degrees is essential to increasing diversity in the field as a whole. First a little background about what’s known about physics graduate school admission practices. Most of the research has focused around the GRE, the graduate school equivalent of the SAT or ACT, which is prevalent in graduate school admissions. However, the quantitative and verbal GREs have been shown to be biased against women and certain racial and ethnic groups. This means that departments that only admit students who have a score above some threshold may be unintentionally excluding underrepresented students. Additionally the use of the cutoff GRE score can prevent some demographic groups from even applying. While the GRE scores and other numerical measures (like GPA) are often used in the admissions process, there is limited evidence to suggest these are related to important outcomes of graduate school. For example, while the GRE is correlated to first year graduate school GPA, it is only weakly correlated with citation counts, research products, and time-to-degree. In addition, numerical measures may not capture work-related experiences that would make a student a strong candidate for research, strong interest in science, or motivation for pursuing graduate studies, where the latter two have been shown to be predictive of a students’ research productivity. To assess the admission practices of physics graduate programs, the authors of today’s paper developed a 30 question survey covering topics such as the importance of various admission criteria (which were rated on a 1-7 scale were 1 is not important and 7 is very important), how student representation may be taken into account, recruiting and process mechanisms including who makes up the admission committee, and demographic information about the respondents. The survey was developed at the 2013 Graduate Education Conference based on input and feedback from both graduate students and faculty. With the help of the American Physical Society, the survey was then distributed to all physics PhD program directors, representing around 200 institutions. Responses were obtained from 170 individuals representing 149 institutions. So what did the authors find? Using the 1-7 point scale to judge how important a factor was in admissions, the authors found GPA in physics and math courses (6.18±0.07), quality of letters of recommendation (5.92±0.08), undergraduate courses taken (5.45±0.08) and physics GRE score (5.43±0.11) to be the factors as rated most important. The least important factors for admission were proximity or familiarity to department (3.17±0.17), written GRE scores (3.75±0.11), prior conference presentations (3.92±0.12) and verbal GRE scores (4.01+0.10). Full results are shown in figure 1. Figure 1: Mean score (1-7 scale) of importance for various admissions criteria. 1 is not very important while 7 is very important. The solid black line is the midpoint of the scale while the dotted line is the mean response across all criteria. (Figure 1 in paper). The authors found that these were pretty consistent regardless of the size of the graduate program. However, the authors found that programs that graduate more PhDs tend to give less importance to the quantitative GRE scores and more importance to recommendation letters, personal statements, prior research experiences, and prior publications than programs that graduate a fewer number of PhDs do. Second, the authors looked what factors are not used in the admissions process as survey respondents had the option to respond the factor was not used rather than rank its importance on the 1-7 scale. 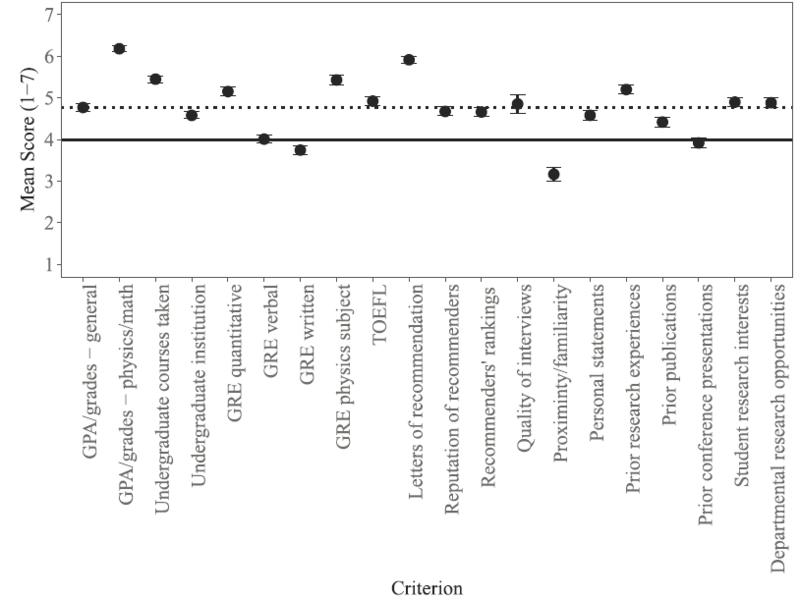 The authors found that quality of interviews, proximity or familiarity to department, recommenders’ rankings of students, and (interestingly) physics GRE scores were among the factors most often reported as unused in the admissions process. Full results are in figure 2. Next, the authors investigated trends in specific admission criteria. The authors found that nearly a third of the departments did use a GRE cutoff and others used a “rough cutoff” or used GRE scores “as a first cutoff.” The prevalence of these “soft” cutoffs was not reported in the paper. However, many survey respondents said that low GRE scores did not eliminate the student but resulted in a more comprehensive look at the application. In terms of gender, about two-thirds of respondents reported that gender is taken into some consideration and about two-thirds of respondents reported that race or ethnicity is taken into some consideration, though taking gender or race/ethnicity into account does not necessarily imply the other is also taken into account. Many respondents reported that their department tries to identify diversity-related fellowships for underrepresented students but their efforts have been largely unsuccessful in increasing the enrollment of underrepresented students. So what can we take away from this paper? First, traditional measures of previous academic success and preparation (undergraduate physics and math GPA, physics GRE scores, undergraduate course work) are viewed as very important in the graduate school admission process. 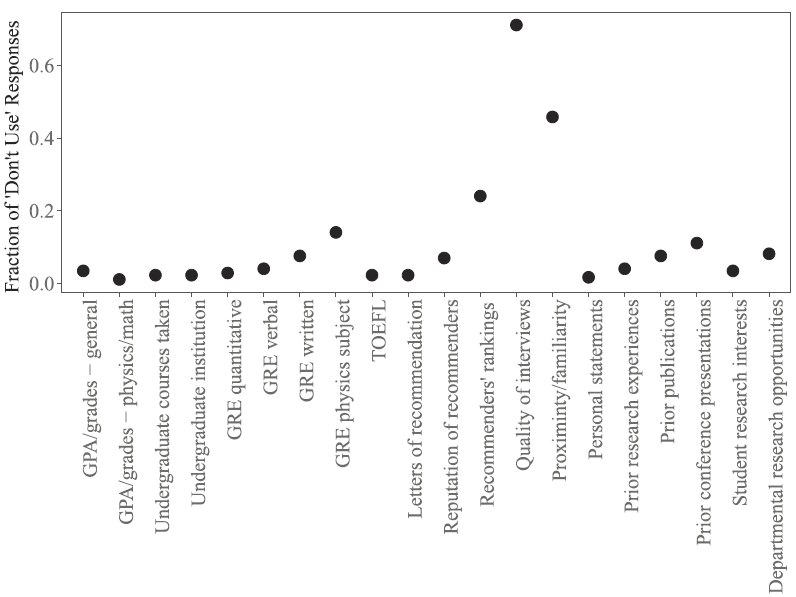 However, as letters of recommendation are also viewed highly, the authors note that these could be used to highlight areas that are not easy to access numerically and could compensate for weaknesses that appear in other parts of the application (such as missing physics “core courses” that may not have been offered if the student went to a smaller institution or low GRE scores). Second, many physics departments do take gender and race or ethnicity into account when admitting students suggesting departments at least acknowledge the need to promote diversity in their graduate programs. Finally, while many departments view the physics GRE as important in their admission decisions, it is also one of the least used factors in the admission process. A recent study (and covered in an Astrobite!) may help explain this discrepancy, namely, that physics GRE scores aren’t predictive of future success. Previous Post:Extra! Extra! Physics labs may be extra.